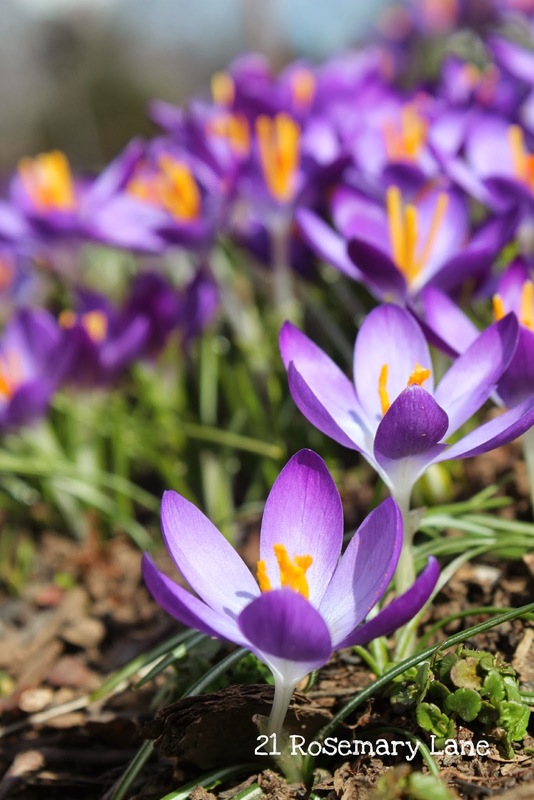 Yay it is finally March and hopefully spring will be here sooner rather than later! Lucky for us, we here in the upper mid-Atlantic states dodged this latest snow storm. I hope those of you in the Maryland and Washington DC areas, and any other state being impacted by winter storm Titan, will fair well. I pray that you do not have to deal with too much disruption to your lives due to old man winter's death grip on this year's wintry weather. I say next year they try pulling a rabbit out of that dang hat up in Punxsutawney Pa., we may have better luck with our wait for spring! So what's new here at Rosemary Lane??? 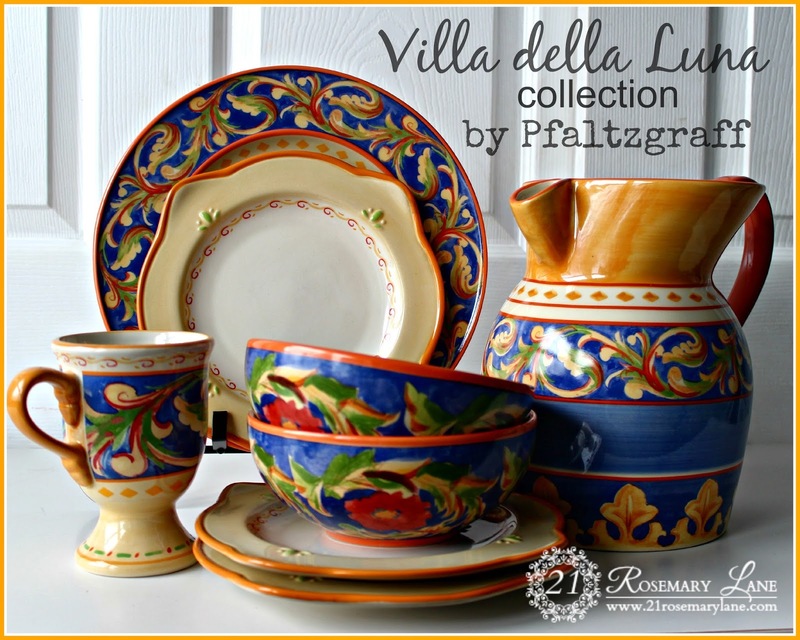 To start, last week I was contacted by the fabulous people at Pfaltzgraff asking if I would like to partner with them once again and create a tablescape using their stunning Villa della Luna collection. I am so excited...can you tell? In addition they have also been wonderful enough to sponsor a giveaway here at 21 Rosemary Lane. 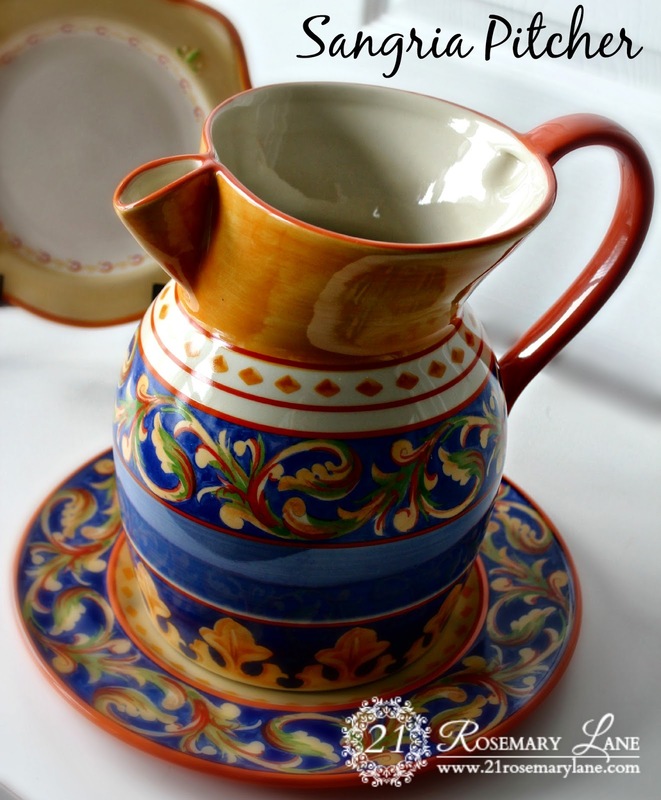 To one of my super lucky readers they are offering a 20 piece service for four including pretty pedestal mugs and a beautiful sangria pitcher! So stay tuned for details and when the giveaway will be taking place. Next let me update you on my master bedroom makeover. 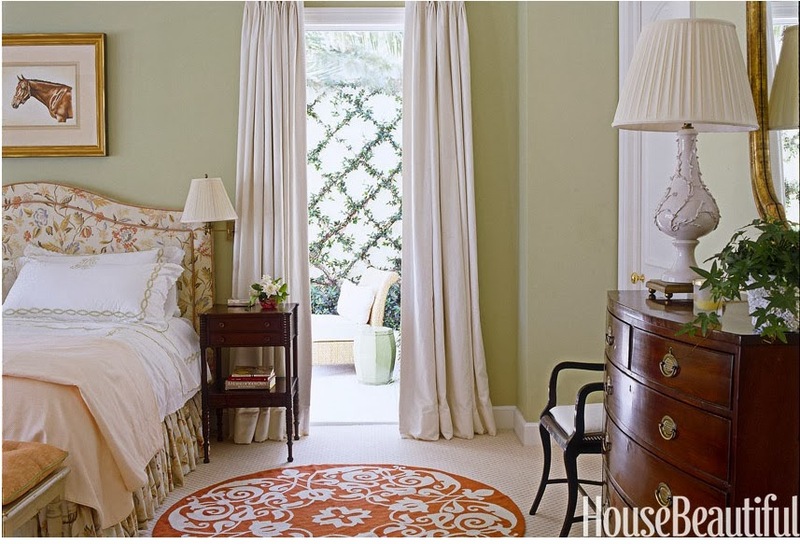 I did paint the room using a color I selected from Benjamin Moore called Ivy Lane. I originally thought the color was pretty close to the inspiration room's color, and while it is a very pretty color, after living with it for about a week it turns out Ben Moore's Ivy Lane is just a wee bit too dark for what I wanted in the bedroom. So I am back to choosing a new color. I may just have to make that one hour round trip up to the C2 Paint store in Chatham and check out their color New Leaf, the one they used in the House Beautiful bedroom. It has just the right ratio of yellow to blue without being too dark. I want my space to feel very fresh and bright like the House Beautiful room. I did decide to rearrange the furniture and incorporated a pretty interesting configuration with regard to my bureau. I went "out of the box" with my thinking and I really like the result. I also have been doing more shopping to find elements to help give me the vibe of my inspiration room...wait until you see what I have purchased! If all goes well my goal is to post the bedroom reveal sometime before the end of this month. And like everyone else I am waiting for the snow to melt so we can begin to be see the little signs of spring. The dishes are beautiful!!! I was the lucky winner last year :-) We use the dishes every day. Good luck finding your paint color. Beautiful dishes Barbara...can't wait to see the table you create using them!! Barbara- Aren't the colors on those dishes just vibrant and beautiful? Oh My Gosh! For some reason they remind me of all the times we stayed in Mexico (before it got scary down there). Gorgeous! I tried to google that paint color and couldn't find a link anywhere-it kept trying to show me painting of a NEW leaf. lol Can't wait to see what you do. You know, I have done the same thing-saw a paint that I KNEW I would love and then it was totally wrong once I got it on the walls. Good for you for redoing it right away. It will be fun to see the full reveal.